Successful construction project and maintenance require a flow of information across the whole network. Investment & project management. Client, construction consultant, planner, builder. 100% data transfer. Flow of information between the actors involved in project management. Life cycle information. Property management, space specialist, users, builder/modifications. Data is easy to maintain and update. Information in the visual model is collected and dynamic. Data is open and transparent. Verifiable data history supports decision making. Managing project scope and keeping on budget. Our platform ensures, that during all of the planning stages, every necessary task is taken care of in the right way, and at the right time. Regardless of the place or format, all of the parties that are involved in the project have access to the latest information in one place. The most efficient platform to push for transparency and re-applicability of decision-making with the help of preserved decision history logs. 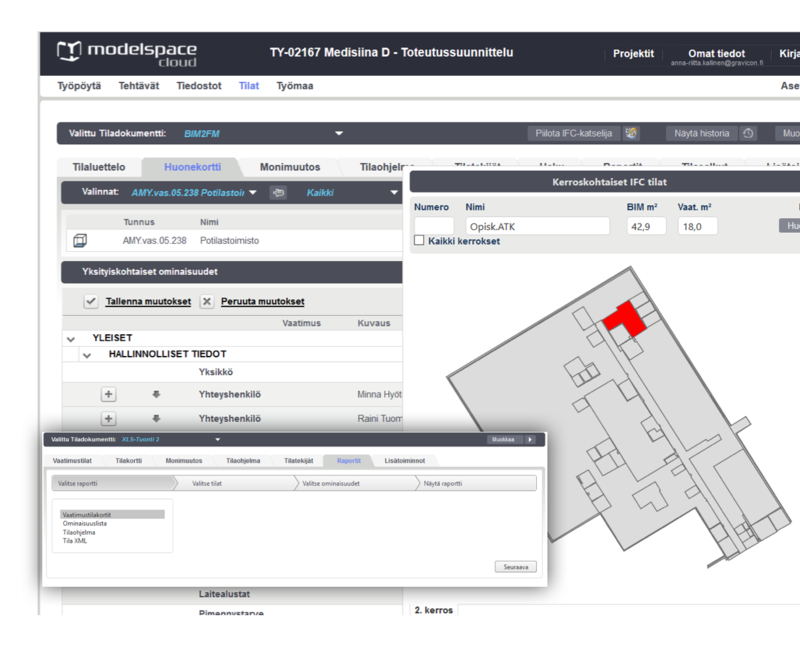 Modelspace is the best-in-class tool for setting the scope of a project and thus staying on the pre-defined budget. The best platform for project management to reassure the best practices on an individual organisation level. All of the investment planning in one place to effectively convert investment-projects straight into construction- or renovation-projects. Investment proposals and portfolio management. Investment management as part of high-quality planning. Manage information and lead on a task-specific basis. Sharing information enhances leadership. Data and content is collected in one place. Ensuring user orientation. Data can also be used during the maintenance phase. Technical and Operational Requirements of Spaces. Information Management for Hospital Projects.